In 1944 Hitler ordered Paris to be destroyed when Allied forces approached the city. On 23 August, Hitler declared that 'the city must not fall into the enemy's hand exce[t lying in complete debris.' By the next day the city's vital bridges and its key monuments and buildings such as the Louvre and Notre Dame had been prepared for destruction. But General von Choltitz, his newly-appointed Governor of Paris, disobeyed his orders. On 25 August he ordered his forces to surrender and never carried out Hitler's command. The controversy over von Choltitz' role in saving Paris from destruction in late August, 1944 has been examined in Rene Clement's unfairly maligned movie Is Paris Burning? 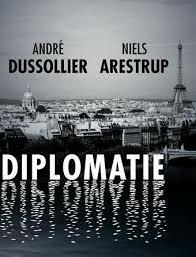 Several decades later the German director Volker Schlondorff takes another look at the issue in his adaptation of Cyril Gely's play Diplomatie. Clément's film follows its source (the non-fiction best-seller Is Paris Burning? ) by attributing von Choltitz' eventual refusal to carry out Hitler's order to the general's shrewd if cynical judgement that with the Allies on the verge of victory, he would do well to build up goodwill with them. The movie has some brief and unconvincing scenes with von Choltitz negotiating Paris's futurewith the Swedish Consul, Raoul Nordling (Orson Welles in a lazy performance). 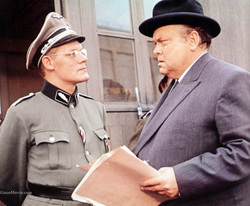 Director Volker Schlondorff with Andre Dusollier as Nordling and Niels Arestrup as von Choltitz. Raoul Nordling wrote his own account of the negotiations with von Choltitz. The real General von Choltitz. The elegant Hotel Meurice is located on the Rue de Rivoli, just across from the Tuileres gardens. It has been one of Paris's top hotel since 1835, and its celebrity guests included Queen Victoria, Picasso. (who had one of wedding dinners there), President F.D. Roosevelt, the Duke and Duchess of Windsor, Tchaikovsky and King Alphonse XIII of Spain (who brought his own furniture). During the Occupation, It was used by the German forces as their Paris headquarters: as von Choltitz's Military Governor suite had magnificent views of the Seine, the gardens and the Eiffel Tower. 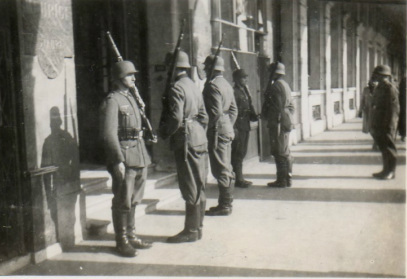 Soldiers guarding entrance during Occupation. Schlondorff'e movie uses considerable dramatic licence to present von Choltitz's eventual decision to disobey Hitler's order as the outcome of a duel between the the shrewd diplomat Nordling and the stern professional and ruthlerss Prussian soldier sworn to obey his commander-in-chief. In the movie Nordling charms, wheedles, and conives as he seeks to persuade ther general that surrendering Paris peacefully is the moral, civilized action that will win him the respect and admiration of future generations. The conflict is between two opposing viewpoints. The general's outlook is based on his family military traditions of obedience to superiors and loyalty to one's word. Nordling's argument emphasises the moral and cultural necessity of preserving a magnificent city and its irreplaceable heritage. Nordling's arguments also include appeals to von Choltitz' self-interest. The general has already been implicated in several outrages carried out under his command, such as the massacres of Jewish civilians on the Russian front, war crimes during the destruction of Rotterdam in 1941 and very recently, the torture and execution of Parisian Resistance members and hostages. With Germany obviously heading for defeat, von Cholditz urgently needed to built up credit with the Allies. Destroying Paris will definitely not be good for him and his family. But saving Paris would undoubtedly ensure a more lenient treatment postwar. This in fact was exactly what happened -the general was released from Allied custody in 1947. Despite the attempts to paint von Choltitz as Paris's saviour,some Paris Resistance figures such as Maurice Kriegel-Valrimont insist that the general kept on killing and destroying until it was no longer expedient for him to do so. He believed Choltitz was motivated by self-preservation, not a noble desire to preserve the city. Pierre Taittinger, the Vichy [collaborationist] head of the Paris Municipal Council, claimed credit for negotiating a deal, a claim not given much credit by modrn historians .However, a crucial role was played by three supporters of General de Gaulle - Roland Pré, Jacques Chaban-Delmas and Léo Hamon - who used Nordling as an intermediary to negotiate with Choltitz over terms of a ceasefire and surrender. 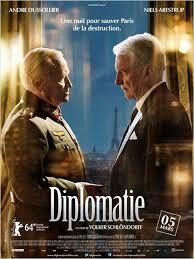 The battle of wits between the general and the diplomat that is the heart of the movie. Members of von Choltitz' staff after surrendering. German officers surrendering in Paris after capitulation.